Insurance agents, and any other professional service for that matter, have a bad habit of talking in industry jargon that leaves their clients with more questions than answers. ACV and RCV coverage are a couple of examples of very important concepts that are essential to understand, so let’s take a moment to define and explain. With a few exceptions (like fine wine or classic cars), most things are worth less as they age. That shiny new car you bought five years ago will sell for a lot less today. This is called depreciation. Actual Cash Value is calculated as the amount it would cost to replace the lost item, minus a depreciation amount that is based on its age. We can think of ACV this way; it is the actual cash you could get today if you sold the item. There are set depreciation standards for just about everything, from roofing shingles to flat screen TV’s. If your insurance is based on ACV and you suffer a loss, you will generally get a lot less money than you need to replace your belongings with like-new items. Roofing shingles can depreciate quickly if ACV coverage is selected on your policy. Shingles are “wear items”, meaning they have an expected life span before they wear out. Most are 30 years, but wind, hail, rain and the hot summer sun, can really take their toll. Your roof goes through a lot, especially here in Middle Tennessee with our wide variety of weather, from hail storms in Spring to ice storms in the Winter. Many insurance companies ONLY offer ACV coverage on roof claims. It lets them give you a lower insurance quote, but when damage occurs, the homeowner is often left with higher out-of-pocket expenses! Most insured’s prefer Replacement Cost Coverage! 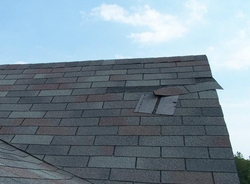 We offer Replacement Costs coverage on all perils if your roof is less than 15 years old. This means that your roof, home, and the contents inside (like that 50 inch flat screen I mentioned earlier) are not depreciated! Unsure on your current coverage? Contact us for a free review of your current policy.